GENTING Hong Kong Ltd (Genting HK) is probably getting ready for a celebration right now. The Hong Kong-based cruise and casino operator, which is controlled by the Lim family, believes it has a good chance of getting approval from the Australian authorities to raise its stake in Echo Entertainment Group Ltd, which operates four casinos Down Under, according to sources. Genting HK expects the New South Wales (NSW) Independent Liquor and Gaming Authority and the Queensland Attorney-General and Minister for Justice to give the green light “soon”, sources say. The approval would allow Genting HK to establish a stronger footing in Australia — the second destination after Manila in the Philippines. The company, in which Genting Malaysia Bhd (fundamental: 2.40; valuation: 0.80) holds a 17.81% stake, has been seeking approval since June 2012 to buy more shares in Echo and become the single largest shareholder in the company. Currently, Genting HK (fundamental: 2.10; valuation: 2.40) is the second largest shareholder in Echo with a 6.6% stake. Commonwealth Bank of Australia is the largest shareholder with 8.46% equity interest, according to filings with the Australian Securities Exchange. Genting HK, which has dual listing in Hong Kong and Singapore, has been rather aggressive in expanding its gaming business in recent years. The Genting Group’s Lim family holds a 61.68% stake in the company. “The key areas to tap into are Brisbane and Gold Coast,” a source says, adding that Echo has submitted a bid for a A$1 billion (about RM2.8 billion) development in Brisbane. After the local government invited bids for a new integrated casino resort in Brisbane, Echo pledged to invest A$1.5 billion to transform its Treasury Casino & Hotel in central Brisbane and Jupiters Hotel & Casino in Gold Coast into two integrated resorts. The company’s rival, James Packer’s Crown Resorts Ltd, also submitted a bid for the Brisbane project. It is worth noting that Echo’s share price more than doubled to an all-time high of A$4.71 last Friday from A$2.35 on April 10, 2014. For the financial year ended June 30, 2014, the company reported a net profit of A$106.3 million, up 27.3% from A$83.5 million the year before. Revenue grew to A$1.81 billion from A$1.74 billion in 2013. In October 2013, Queensland officials disclosed that they would grant three new casino licences — one in Brisbane, one in nearby Gold Coast and one in the more remote northern part of the state. Believing that integrated resorts are the answer to the state’s bleak tourism outlook, the Queensland government said the three licences would only be granted for the development of casinos that are part of integrated resorts. Already, Queensland is the state with the most casinos in Australia. 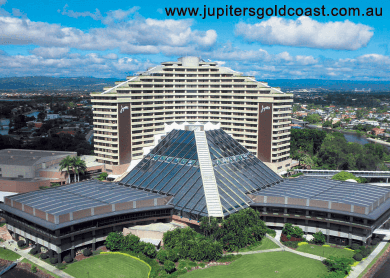 Echo operates Jupiters Hotel & Casino Gold Coast, Treasury Casino & Hotel (Brisbane) and Jupiters Hotel & Casino (Townsville) there. Meanwhile, Casinos Austria International Ltd and Accor Casino Investments (Australia) Pty Ltd jointly own The Reef Hotel Casino in Cairns. Should the three additional casino licences be granted, Queensland will see a total of seven casinos in the state. This will also mean that the rivalry between Echo and Crown will continue in Queensland after Sydney two years ago. To recap, Echo is currently the sole casino operator in NSW. However, the state government has granted a gaming licence to James Packer, the third richest Australian, for his A$2 billion development in Barangaroo, to commence in 2019. Echo’s exclusive casino licence expires in 2019. Echo manages The Star Sydney Casino & Hotel in Sydney, the second largest casino in Australia after Melbourne’s Crown Casino. Interestingly, Crown chairman Packer was once a substantial shareholder in Echo. He sold his 10% stake in the company for A$264 million in May 2013. In July the following year, he obtained the casino licence from the NSW government. It is also worth noting that NSW Independent Liquor and Gaming Authority as well as the Queensland Attorney-General and Minister for Justice had granted Packer the right to increase his stake in Echo to 23% from 15% in 2013. But Packer decided to build casinos under Crown instead. Genting Singapore Plc, which is 52.64% owned by Genting Bhd, once acquired a 4.8% stake in Echo in June 2012. Three months later, Genting Singapore placed out its entire stake at A$3.99 apiece for A$158 million. While its Singapore counterpart does not think that Echo fits into its plans, Genting HK believes otherwise. As at end-2014, Genting HK had cash and cash equivalents of US$718.5 million, down from US$935.4 million a year ago. Its net profit for financial year 2014 dipped 30.4% year on year to US$384.5 million. Revenue rose 2.9% to US$570.8 million. Genting HK’s share price closed at 37 US cents last Friday, translating into a market capitalisation of US$2.97 billion.